A small Predynastic cemetery near to Alawniyeh labelled 'site L', and published graves number from 200-229 (only 45 tombs were excavated although 300 were estimated to be present). A Predynastic habitation area, cut through by later Old Kingdom to Middle Kingdom tombs, labelled 'site M' and divided by the excavators four portions M1-M4. Finds from the Predynastic settlement remains in area M1 were numbered 'S1' and those from M2 were labelled 'S2'. The published tombs were numbered between M1 and M560. Also near el-Mahasna was an area labelled 'Site N', containing Late Old Kingdom to Middle Kingdom burials. A Dynasty 3 cemetery where 5 large mastaba tombs were excavated near Bet Khallaf, labelled 'site K' and the tombs numbered 'K1-K5'. A few flint sickle blades were sent from the Pitt Rivers Museum to Ghana in 1951, but the majority of the flint assemblage (some 700 pieces) remains in Oxford. Garstang, John 1903. Maḥâsna and Bêt Khallâf. British School of Archaeology in Egypt and Egyptian Research Account  (7th year). London: Bernard Quaritsch. 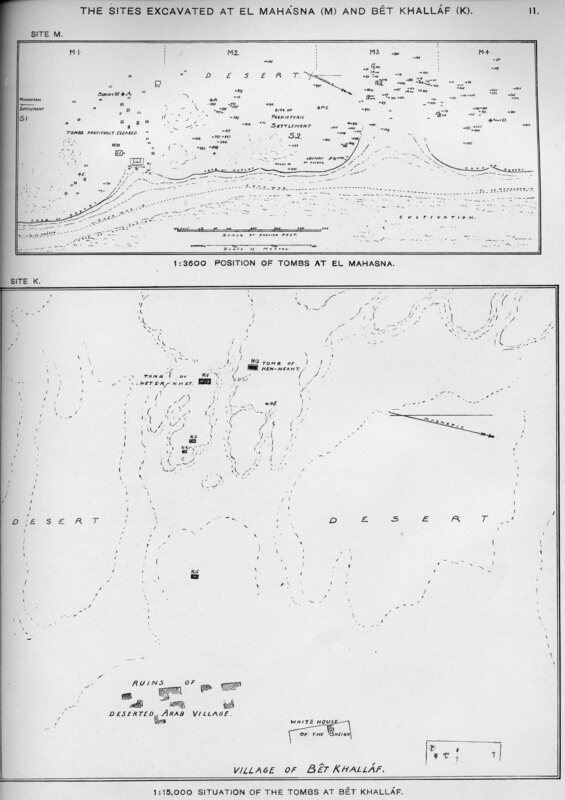 Map of sites excavated at Mahasna and Bet Khallaf from Garstang's (1903) excavation report.